The variety of different sounds that an electric drum set can produce is almost unlimited, and you can access hundreds of different drum kits from a single set. The greatest advantage of choosing an electric set is the ability to tap into an endless range of sounds. An electric drum set is often also known as electronic drum set. These are essentially the same thing. Although some electronic models come in the form of drum pads rather than drum kits. Each have their own advantages, but either way, adding electricity to the mix can add a whole new level of features you just can’t get with an acoustic set. It can be used for pre-recorded percussion phrases, and it’s also great for adding delay and reverb effects. To practice with electric drums, all that you need is a pair of headphones. Electronic drums are ideal for drummers who enjoy a variety of different music styles, and the drums can be set up for every type of genre. Since they don’t require microphones, electric drums eliminate the problem of sound bleeding from other instruments. They also make it much easier to edit your performance. Although an electronic drum set might seem complicated, it’s easy to understand. Each drum has a rubber head, and a sensor is installed under each head. When you strike the rubber head with your drumstick, the sensor sends a specific voltage to the sound module, which translates the voltage into a specific sound. The drum kit’s sound module can also measure how hard the rubber pad is hit. It translates the velocity into a dynamic value. Depending on the complexity of the drum set, there could be one, two or three sensors installed underneath each rubber pad. 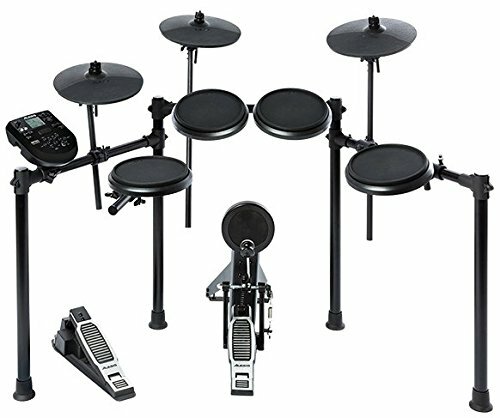 To get the best sound, you’ll need the best electric drum set, and below, you’ll find 10 of the top products available. The Carlsbro CSD130XXX features a Digitron display, and it offers 250 different percussion voices. It comes with 20 preset drum kits, and for maximum compatibility with other devices, it has a line output, AUX input and headphone output. It comes equipped with a USB interface and MIDI port. 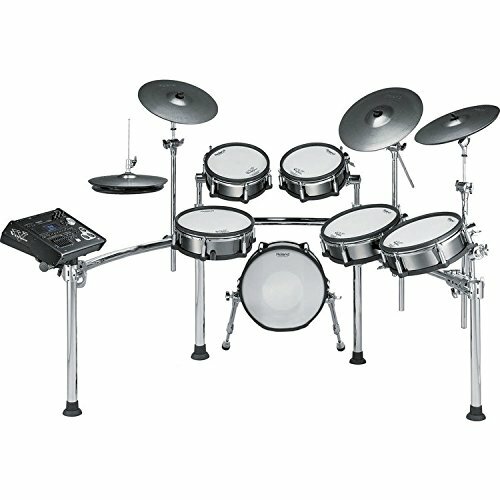 Although it’s considered a midrange product, this electric drum set produces CD-quality sound. In addition to this, the durability is high enough for long road trips and touring. When it comes to electronic percussion, this drum kit aims to set new standards. It has been designed with inspiration from thousands of different drummers. If you don’t have a lot of experience with this type of product, then you’ll need to spend some time reading the manual and getting acquainted with the technology. The Carlsbro CSD130XXX might not impress a professional drummer, but for the beginner, it’s a product that is worth considering. The Yamaha DTX400K is a customizable drum set, and it comes with 297 different sounds. This model features the drum trigger module, and it’s like owning 10 different drum sets in one. The set comes with a 7.5-inch snare pad, and it has all the basic components that a beginner would need. The silent kick bass drum unit produces high-quality sound, and with several 7.5-inch pads, this set is equipped with enough components to produce many types of music. The Yamaha DTX400K comes with 10 different settings, which can be customized for your personal preferences. It also has a drum throne and includes JVC stereo headphones. With the Yamaha DTX400K, you’ll get the best sounds that come with their well-known DTX models, and the set comes with an interactive training system. Since this is a full-size kit, drummers of all skill levels should enjoy it, and the steel rack system is built for superior durability. The individual components can be customized to match your preferred style, and the interactive training is almost like having a personal drum teacher. The Alesis DM10 is a premium electronic drum set, and it comes with the DM10 brain system, which is great for quiet practice or live performances. The built-in digital library contains 1,000 different sounds, and you can access sounds from almost any genre. The sounds can be reassigned, and they’re sensitive to the amount of force delivered by each drum strike. The sound library is comprised of uncompressed sounds, and it can be expanded through MIDI and USB inputs. The modules and software instruments can be controlled through these ports, and every high-definition sound can be customized. The Alesis DM10 electric drum set comes with a RealHead tom, snare and kick pads, which are made with Mylar heads. The high-quality material delivers realistic rebound and sticking, and the entire kit is designed to offer a natural playing experience. Since this is a standalone kit, it can be plugged into a stereo or used with headphones, and you can even load it with third-party sound sets. The BEHRINGER XD8USB is an eight-piece set, and with the HDS110USB sound module, it’s able to produce high-quality percussion sounds. This set comes with everything needed to begin playing immediately, and for additional sound flexibility, it comes with 10 factory presets. The BEHRINGER XD8USB includes five user-programmable drum sets. Since it has a USB interface, it can be connected with drum software and virtual instruments. High-definition sampling is built into the set, and it can deliver an authentic drumming experience. 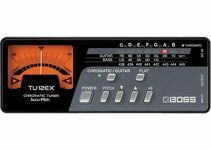 The BEHRINGER XD8USB is popular because it comes with all the components needed to immediately begin playing. Some of the best components are the hi-hat control pedal and single-zone pads. The drum rack is easy to assemble, and it comes with the required mounting hardware. The BEHRINGER XD8USB gives you 123 different sounds to choose from, and it can help to release your inner creativity. The Alesis CompactKit 4 is a portable tabletop electronic drum kit, and it uses four sensitive pads to deliver realistic sound. Since this is a basic, compact kit, it’s much more affordable than most of the other products on this list. Despite the lower price, the Alesis CompactKit 4 offer 70 percussion voices, 50 play-along songs and 10 effect voices, which are built into the system. The Coach feature can be very helpful because it displays notes on an LCD screen and teaches you how to play. 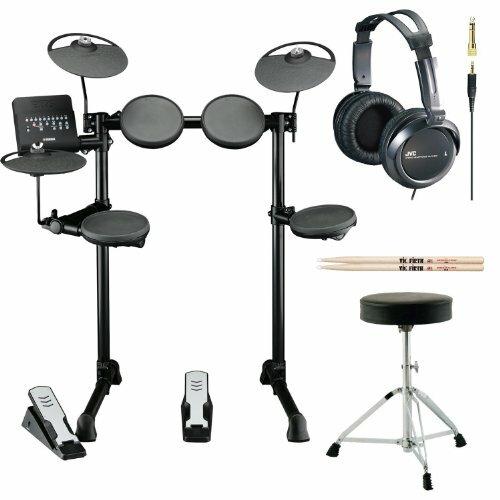 Since this electric drum set comes with all the required components, you can begin playing immediately. With six C batteries, which aren’t included, you can take this drum set anywhere and put on a live performance. The included drum pads are very sensitive, and they can detect the velocity of your drum strikes. Dozens of built-in songs are available for practice, and you even get a pair of drumsticks. 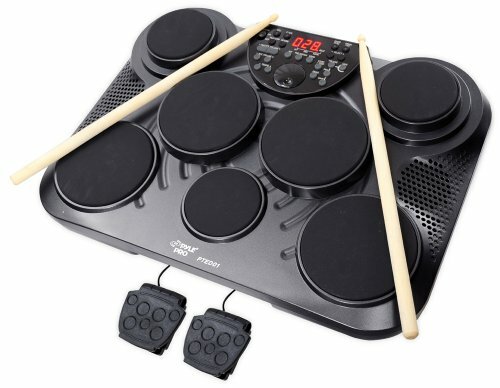 Here we have another top product from Alesis, the eight-piece Forge Kit electronic drum set. It comes with comfortable, dynamic rubber pads, which produce a natural response and feel great. The set comes with an 11-inch dual-zone snare and three single-zone toms. A bass drum pedal and kick pad tower are included. Also, the Alesis Forge Kit comes with three 10-inch cymbals. The sound module included with this set contains 70 different drum kits and 600 sounds. With several different components, this kit makes it possible for anyone to play like a professional drummer. For additional sound options, it can be connected to a computer. When sitting behind this electric drum set, most players will feel at home. The included sound module contains all essential connections. The Forge Drum module is extremely versatile and allows you to load your own samples. It has a USB memory stick input, which you can use to load your own .WAV files. The Pyle-Pro PTED01 is another tabletop drum kit, and with seven pads, it gives you total control over the sounds you’re producing. Since each drum pad is very sensitive, it can detect the velocity of your strike and adjust the sound accordingly. 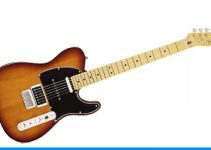 When compared to some of the other products on this list, the Pyle-Pro PTED01 is very affordable, and it features a two-pedal pad layout. It comes with 25 preset drum kits and 215 percussion voices. 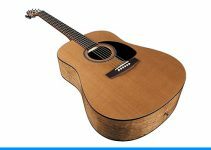 The built-in sound module contains 100 songs, five user kits and one demo song, and to provide the user with additional music options, it has a convenient USB port. Although this drum set is very affordable, it doesn’t lack any of the basic features. Also, the control center makes it easy to edit and record your music. 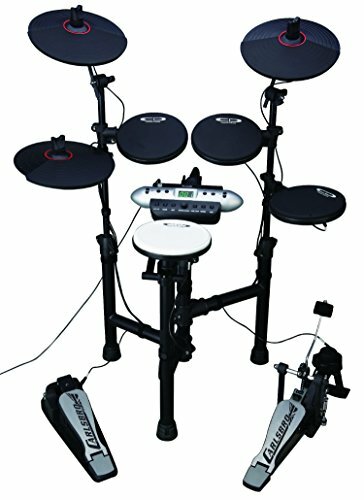 The LCD screen can be read easily, and with a wide range of adjustable audio controls, this product can help you unleash the professional drummer within. 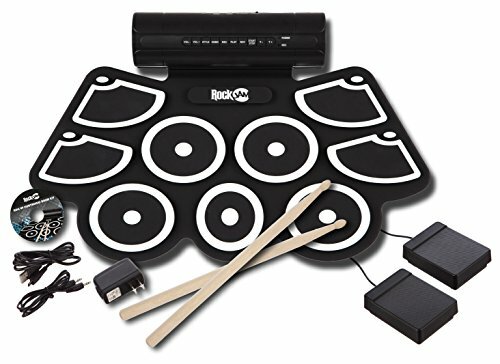 The RockJam Electronic Roll-Up MIDI drum kit is designed for portability, and it can help any drummer produce realistic sounds. Although powered by electricity, this kit produces audio that doesn’t sound like it’s coming from an electric drum set. With a total of nine drum pads, it’s great for producing a wide range of sounds. Some great examples are the ride cymbal, low floor tom, open hi-hat, snare, high tom and crash cymbal. 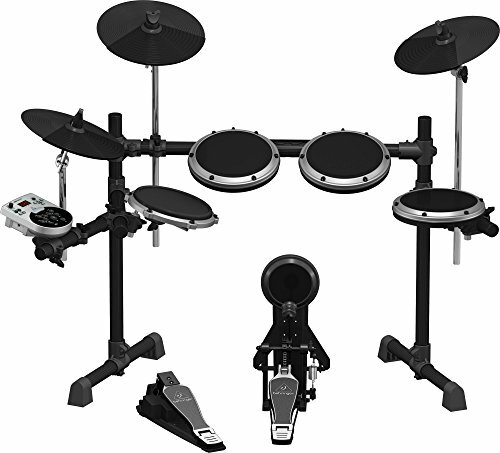 The RockJam electric drum set has a USB MIDI connection, which makes it easy to upload beats to a computer. The thick pad is designed to make traveling easier because it rolls up quickly and easily. This set includes built-in speakers, drumsticks, power supply and two pedals. If you want to play quietly, you can plug in your favorite pair of headphones and enjoy silent practice. 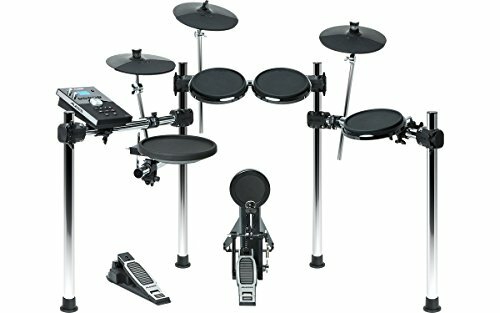 The RockJam electronic drum set is very basic, but it can still provide countless hours of creative drumming. The Alesis Nitro Kit is one of the best electric drum sets available. For a natural response, it is made with dynamic drum pads. The eight-inch rubber drum pads feel comfortable, and they’ll make you feel like you’re playing real drums. 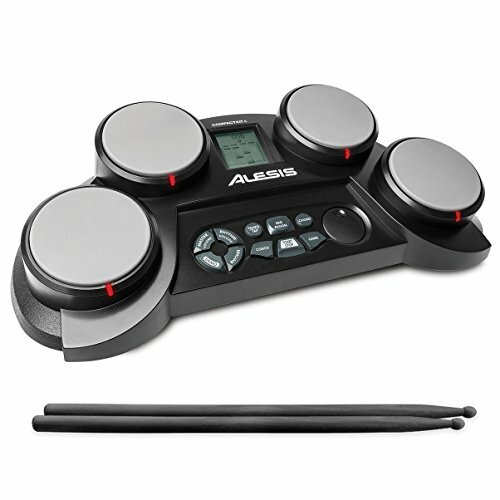 Like other Alesis products, this electronic drum set comes with a kick pad and bass drum pedal. It also includes 10-inch cymbals. For additional stability, it uses a four-post aluminum rack, and comes with eight different pieces for you to play with. The feature that sets this product apart from other drum sets is the Nitro drum module, which offers hundreds of different percussions sounds. The module also provides 40 different kits, and it has 60 built-in tracks to play along with. If you have plenty of money to burn and want one of the best electric drum sets available, consider the Roland TD-30KV V-Pro Series. 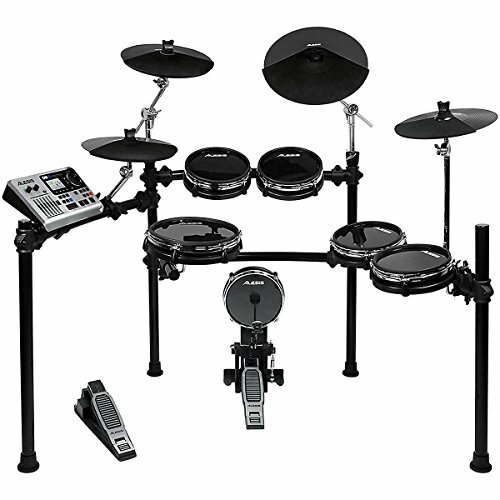 This electronic drum set comes with the flagship V-Drums, and for natural sounds, it uses advanced sensor technology. It features a dedicated ambiance fader, and the overhead mic simulation delivers incredible sound. Behavior Modeling technology makes every sound seem more realistic. Also, for sound customization, the Roland TD-30KV includes a professional V-Edit mode. iIt is one of the costliest electronic drum sets on the market. However, the Roland TD-30KV offers many advanced features that you won’t get from cheaper drum sets.